In Part I of this post I made a topic model of the speech of Shakespeare characters from eight plays. Here in Part II I'll analyze the results of the model. Download notebook. In this post I extract all the words spoken by each character in eight of Shakespeare's plays. Then I construct a topic model to see which characters are generally speaking about similar things. In Part II I look into the information revealed by the topic model. Download notebook. To extend on my post about plotting and reshaping data from the BART API, I worked a bit with the matplotlib annotion interface to add text and arrows to a plot. The meat of this post is in cell #4 below. Download notebook. Spark 1.2.0 was released yesterday (release notes). I'm curious to see how the new machine learning API's in spark.ml evolve. 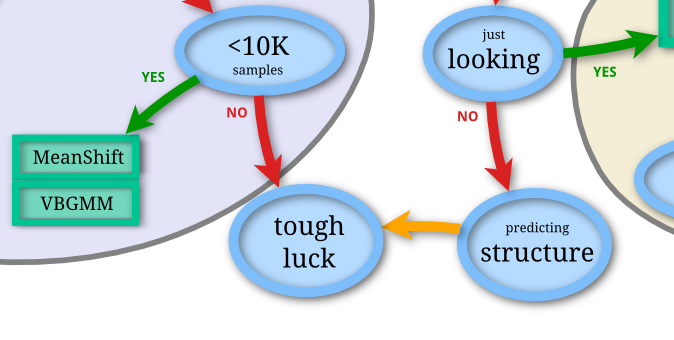 Scikit-learn has a nice flowchart of when to use different machine learning algorithms. View the whole chart here. Download IPython notebook for this post. It's easy enough to make a plot using matplotlib. A common need in data science is to test if a some group of data contains a given value. One specific example would be to test if a word is a stop word. A friend of mine recently asked me to share some of my experiences in making the transition from a biophysics Ph.D. student to data scientist. I realized there are probably a lot of people interested in making a similar transition who could benefit from my experience. I put together a list of data science and python videos that I've found to be especaily useful and entertaining. The list is here, also linked from the nav bar up top. I put together a list of data science books I recommended, including a few for preparing for data science interviews. The list is availiable here.